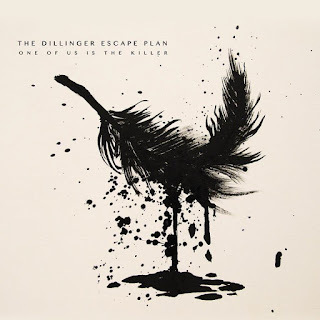 The Dillinger Escape Plan’s fifth album “One Of Us Is The Killer” is a frustrating one. On the one hand, there are a number of the spastic, intense jams that listeners of the band have known to come and love, but on the other the band makes some very questionable moves that scar their otherwise strong track record. Examples of the former include the lead single “Prancer”, which is standard DEP with some small djent flourishes, and “When I Lost My Bet,” which demands total attention due to its bursts of aggression between Billy Rymer’s skipping snare drum hits. That promising opening salvo is quickly upturned with the title track, which strangely enough starts out sounding like slow lounge music until Rymer’s bass drum periodically tramples over it. The guitars in the verse are delicate, and along with Greg’s light falsetto, the mood calls for something other than Rymer’s quick off beat kicks. Unfortunately, there isn’t much to appreciate in the chorus either, which can’t be saved from mediocrity by Greg Puciato’s strong vocals. It’s not that the song is completely terrible, but compared with the first two tracks, “One Of Us Is The Killer” is lacking. “Hero of the Soviet Union” also fails to fully deliver the goods. It begins with classic DEP rhythmic chaos, and later attempts to build to a powerful climax, but the end just doesn’t stick. This lack of memorability permeates most of the album. Later tracks “Paranoia Shields,” “Magic That I Held You Prisoner,” and “The Threat Posed by Nuclear Weapons” all recede from memory not long after being heard, even though they contain a lot of the fury that DEP is known for. Though those tracks fail to stick in the brain, the same cannot be said about the worst track on the album: “Nothing’s Funny.” Though it starts promisingly enough with a stalking Meshuggah-like riff, the chorus is cringe-worthy. The way Greg pronounces “funny” (fuuun-NAY) is grating to this reviewer’s ears, and the chorus is essentially bare of anything of interest. Even the change to double time comes across as a half-hearted way to save the song, and though the added energy is welcome, it isn’t nearly enough. It’s hard to see a band like DEP put out a record like this. Though they’ve recorded bona fide masterpieces before, here their consistency slips. The listener ends up with a handful of worthy mathcore tracks and a pile of almost-there experiments, not-quite-there tracks, or just plain mistakes. When DEP are charging full speed ahead, they’re unlike any other band playing. Unfortunately those moments are more rare on this album than previously, replaced with a slightly more traditional writing that just doesn’t suit a band whose bread and butter is complete sonic anarchy. DEP’s choice to incorporate more standard sounding choruses lead to some of the least memorable songs they’ve yet created, and an album that deserves far less spins than the rest of their repertoire.